As a true Gamer, you've played Minesweeper at least once! But do you have enough courage to challenge your intellect in this absolutely new, live environment where the mines don't sit in one place?! The mines buzz and sting, but the honey is so desired! Behind each closed cell lies either sweet fragrant honey or a hidden stinging bee. But honey is so sweet! Moreover, if you do not freeze the hidden bees, they will walk all around the honeycomb confusing you, closing the opened cells and threatening you with only one, but very painful sting. 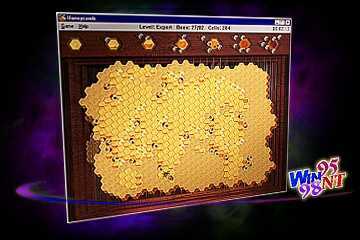 Therefore, if you consider yourself a real "Honey" of a player, Honeycomb is made for you!! !